Imagine reaching your 70s thinking you had no siblings, only to discover not one but three sisters longing to meet you.That is what happened to Betty Bracey when she was finally tracked down by sisters Gwen Metcalfe, Pat Easton and Fran Sharp. The four were separated as babies and toddlers, and it has taken more than seven decades to get the family back together. During the 1960s, Pat, Gwen, who is 71 and now lives in Kennington, and Betty also all lived less than two miles apart in north London – but their paths never crossed. Pat, 69, from Little Chart, explained how she was contacted this year by a company called Finders who had tracked down Betty, now living in Preston, Lancashire: “I can’t describe how I felt. It was just like a miracle. 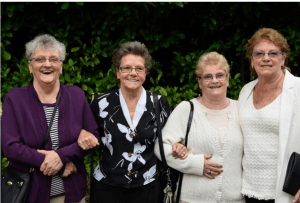 As soon as contact was made the siblings could not wait to meet up, and last week that dream came true when Betty, 71, and her daughter Andrea travelled south for an emotional reunion with her family at The Croft Hotel in Ashford. However, the happiness of finding Betty is also tinged with sadness as a fifth sister remains lost to the family. Despite years of trying, Margaret, the eldest of the quintet, has never been tracked down. Pat said: “We think she was living in Coventry, but she was adopted so we don’t even know what her name might be.